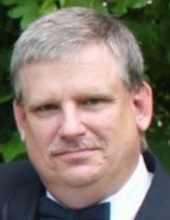 It is with deep and heavy sadness that we announce the passage of Robert Scott Arnold, 49, of Hampton, GA who passed away suddenly on March 26, 2019. Scott was a 1988 graduate of Griffin High School, Griffin, GA. He was an employee of Delta Airlines at Atlanta Hartsfield Jackson Airport, with 29 years of service. Scott was a generous, witty, and devoted father and grandfather. He truly enjoyed family time with Terri and his four children. He was proud of the great effort he took to keep the lawn cut perfectly and the pool kept pristine so that the children and their families could enjoy the beautiful property. Scott, Sadie and Zachary shared many memorable weekend trips to the mountains to go four-wheeling, as Scott loved the outdoors. In the last few years, Scott took to travelling with his family. They took many cruises to the Caribbean and took trips to Hawaii and Japan. Scott was preceded in death by his father, Billy Ray Arnold. He is survived by his loving partner and best friend, Terri Sweeney; children, Zachary (Sierra) Arnold of Griffin, GA, Sadie Arnold of LaGrange, GA, Miranda Arnold and Gemma Arnold, both of Hampton, GA; grandson, Waylon Arnold of Griffin, GA; mother, Mary Arnold of Griffin, GA; and brothers, Daniel Goss and Steve Goss. Scott was cremated and his family held a private memorial service. To send flowers or a remembrance gift to the family of Robert Scott Arnold, please visit our Tribute Store. "Email Address" would like to share the life celebration of Robert Scott Arnold. Click on the "link" to go to share a favorite memory or leave a condolence message for the family.